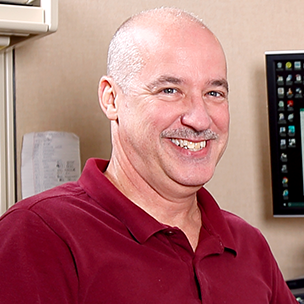 An equalizer can be a sound engineer's best friend, from eliminating feedback in a stage monitor mix to dialing in the sound of your PA system's main speakers. 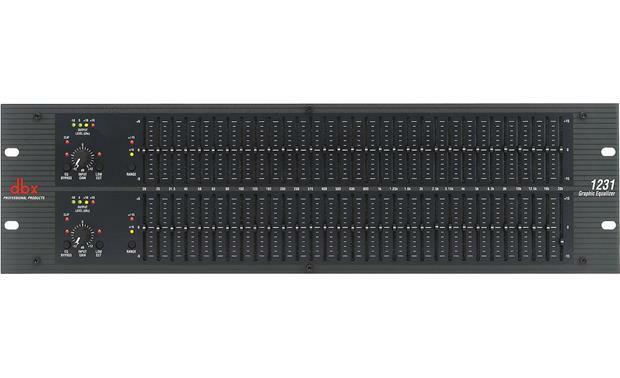 The dbx 1231 offers the features, build quality, and performance you need to get the job done right, again and again. The dbx 1231's long throw faders allow very precise equalization settings. The frequency band centers are marked at 1/3 octave intervals. Each slider will boost or cut at its noted frequency by ±6dB or ±15dB, depending upon the position of that channel's boost/cut range switch. LED lights let you monitor output gain, EQ bypass and signal clipping at a glance. Three types of connectors are provided for input and output: locking XLR type connectors, 1/4" TRS connectors, and a barrier strip. The barrier strip offers screw terminals for input and output, as well as a chassis ground lift strap. When you remove the jumper connecting two screws on the barrier strip, the chassis ground is separated from the circuit ground of the equalizer. It's a handy way to prevent ground loops from introducing electrical noise into your sound system. 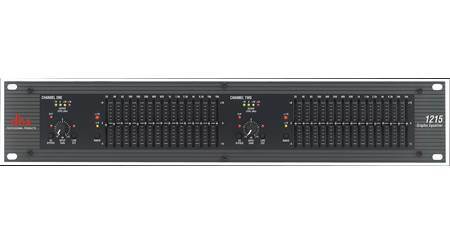 Overview: The dbx 1231 dual 31-band graphic equalizer, part of the 12-series EQs, is a precision-engineered, professional-quality EQ with simple, straight-forward controls. From the magnetically isolated power transformer to the RF-filtered inputs and outputs, the 1231 is designed for years of maintenance-free operations. The 1231 features two independent channels and 31 frequency bands, broken down in 1/3-octaves. Each non-conductive slider has approximately 45mm of movement with a detent at the 0 (flat) position. 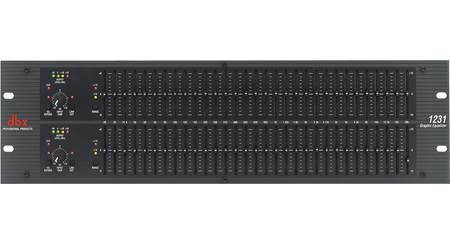 The 1231 fits neatly into a standard equipment rack (3U space required), and includes 4 rack mount screws and washers. Input Gain: The 1231 is equipped with a rotary input gain control to set the signal level to the equalizer. The input gain control has a range of -12dB to +12dB. You can monitor the input to the EQ through the 4-LED Output Level Bar Graph, which has green (-10dB, 0dB), yellow (+10dB), and red (+18dB--3dB below clipping) indicators. There is also a red LED to indicate if the input signal is clipping. 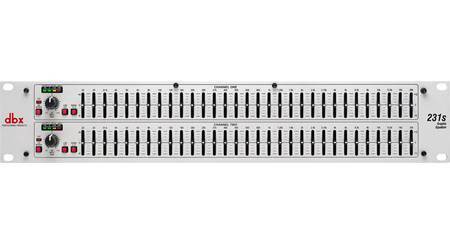 The 1231 has independent input gain controls for each channel. Frequency Bands: The 1231 includes the following frequency bands at ISO standard spacings: 20Hz, 25Hz, 31.5Hz, 40Hz, 50Hz, 63Hz, 80Hz, 100Hz, 125Hz, 160Hz, 200Hz, 250Hz, 315Hz, 400Hz, 500Hz, 630Hz, 800Hz, 1kHz, 1.25Hz, 1.6Hz, 2kHz, 2.5kHz, 3.15kHz, 4kHz, 5kHz, 6.3kHz, 8kHz, 10kHz, 12.5Hz, 16kHz, and 20kHz. Switchable Boost/Cut Range: The dbx 1231 has a maximum boost/cut range of +/- 15dB. If desired, you can switch to a range of +/- 6dB. This gives you finer control within the range. The boost/cut range switch is located on the front panel, and is recessed to prevent accidental activation of the switch, possibly causing damage to other sound system components. LEDs indicate which boost/cut range is selected (red for +/- 15dB and yellow for +/- 6dB). There are Boost/Cut Range switches for each channel. Low Cut: To instantly cut out low frequencies, you can engage the built-in Bessel 40Hz 18dB/octave low cut filter. The Low Cut switch is located on the front panel, with an LED that glows red when the filter activated. The Low Cut switches are recessed to prevent accidental activation of the switch, and are provided for each channel. EQ Bypass: Each channel has an EQ Bypass switch, which bypasses the graphic equalizer section in the signal path, when activated. An EQ Bypass switch is provided for each channel, with a red LED that glows when the switch is engaged. Note: When the EQ bypass is activated, only the graphic equalizer section is effected. The input gain and low cut filters remain unaffected when the EQ is bypassed. Inputs: The dbx 1231 is equipped with a 1/4" TRS (tip/ring/sleeve) phone jack and a female locking XLR (pin 2 hot) input connector for each channel. It also includes a barrier strip for hard-wiring the input cable. Each input can accept balanced or unbalanced input sources. The maximum acceptable input level is typically +22dBu (ref: 0.775Vrms). Outputs: Each channel has a 1/4" TRS phone jack and a male XLR output connector. They also include a barrier strip for hard-wiring the output cable. The outputs can be used with either balanced or unbalanced loads. The maximum output level is greater than +21 dBu balanced/unbalanced into 2 kΩ or greater, >+18 dBm balanced/unbalanced (into 600Ω). AC Power: The 1231 has a 3-pin IEC power cord receptacle, and comes with a 7-foot AC power cord. 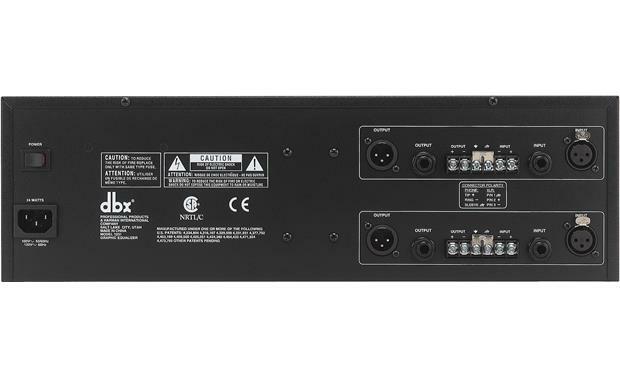 Searches related to the dbx® 1231 Dual-channel, 31-band graphic equalizer.